Kiliuda Consulting, LLC provides expertise in the areas of Programmatic, Technical, & Administrative Services. 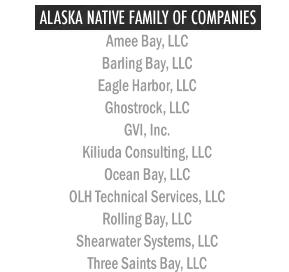 Kiliuda is an 8(a) Program certified, Alaska Native Corporation (ANC)-owned, Small Disadvantaged Business (SDB). We are a subsidiary of Three Saints Bay, LLC, which is owned by Old Harbor Native Corporation. Our Corporate Office is in Germantown, MD; our Contracts Services Division is in Manassas, VA; and our Corporate Headquarters is in Anchorage, AK. Copyright 2016. Kiliuda Consulting, LLC. All rights reserved.